As I wrote in my story on one year of iPad Pro, I consider cloud services a necessity for managing files on iOS. 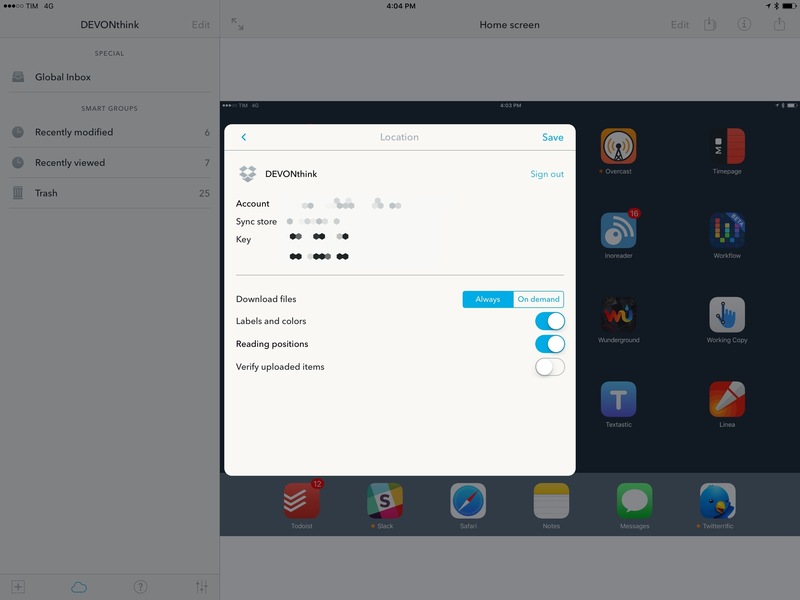 Dropbox and iCloud Drive make it possible to keep the same sets of documents and app libraries synced across devices, but, more importantly, they help overcome iOS' file management woes through centralized storage spaces. 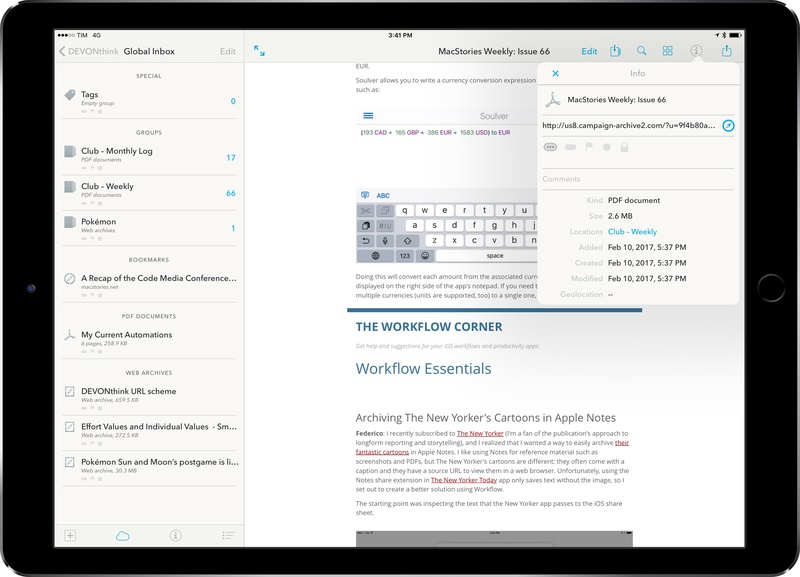 In the article, I espoused the flexibility of Documents and its tight integration with Dropbox, noting how Readdle had built the missing iPad file manager with features Apple omitted from their iCloud Drive app. Since early January, I've been thinking about my larger writing projects scheduled for 2017 and whether Documents can scale as a reference and research tool. Looking back at 2016 and the time I poured into organizing and referencing files for my iOS 10 review draft in Scrivener (which I covered here), I realized that neither Scrivener's built-in file manager nor Documents could meet the basic requirements I have set for this year's review. 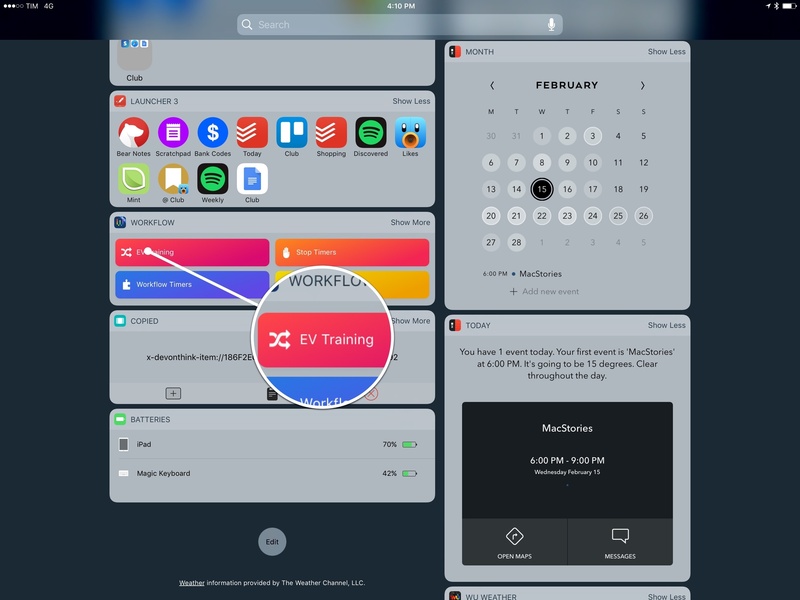 These include the ability to search different file types with advanced operators as well as a system to reference individual files and folders throughout iOS with local URLs. It was during this meta-research phase1 that I decided to try DEVONthink To Go again. I briefly mentioned DEVONthink To Go last year when I explained how I was archiving PDF versions of our newsletters in the app. DEVONthink isn't completely new to me: years ago – before my move to iOS – I used DEVONthink Pro as an Evernote replacement on OS X for a few months. I eventually abandoned the app because I didn't need its power-user features at the time, and Evernote was good enough. Today's DEVONthink To Go is a deeply different iOS counterpart than the lightweight client DEVONtechnologies launched in 2010. 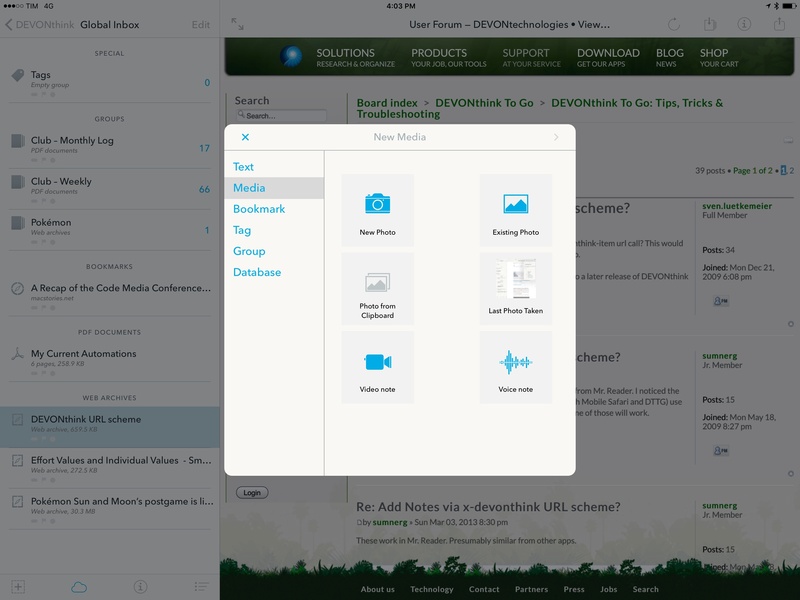 While the first iOS version was a glorified viewer for the desktop app, the latest DEVONthink To Go is a capable mix of a file manager and research tool that takes advantage of native iOS features. 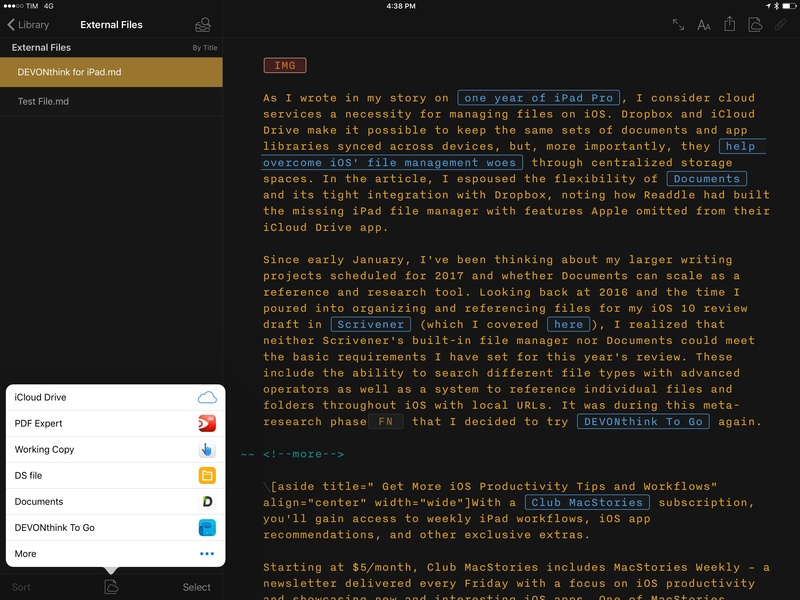 DEVONthink for iOS still doesn't sport feature parity with macOS (particularly in terms of AI-infused document filing options), and there are some functionalities I'm not interested in, but there's also a lot I enjoy and want to implement in my longform writing projects. In DEVONthink, you can set up multiple databases and individually sync them with multiple cloud services. One of the app's immediate advantages over alternatives is that you can choose Dropbox sync on a per-database basis and add encryption (with a passphrase) on top. In the Location Sync settings, you can even select whether DEVONthink should always keep a downloaded copy of your files or if it should only download them on-demand and discard them once you're done viewing them. The latter is a nice solution to the problem of keeping thousands of documents in the cloud but having limited storage space on an iOS device. Copying an item link in DEVONthink. 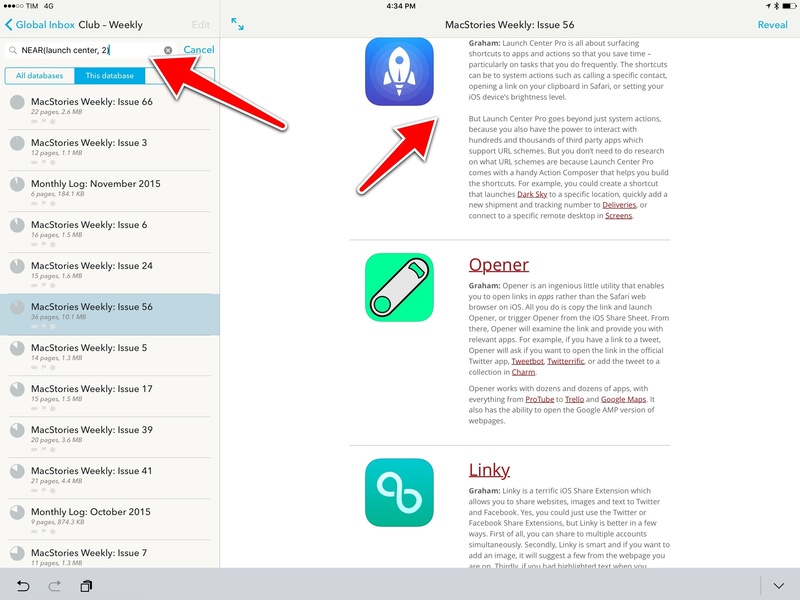 The URL scheme generated by DEVONthink can become a widget launcher in Workflow. 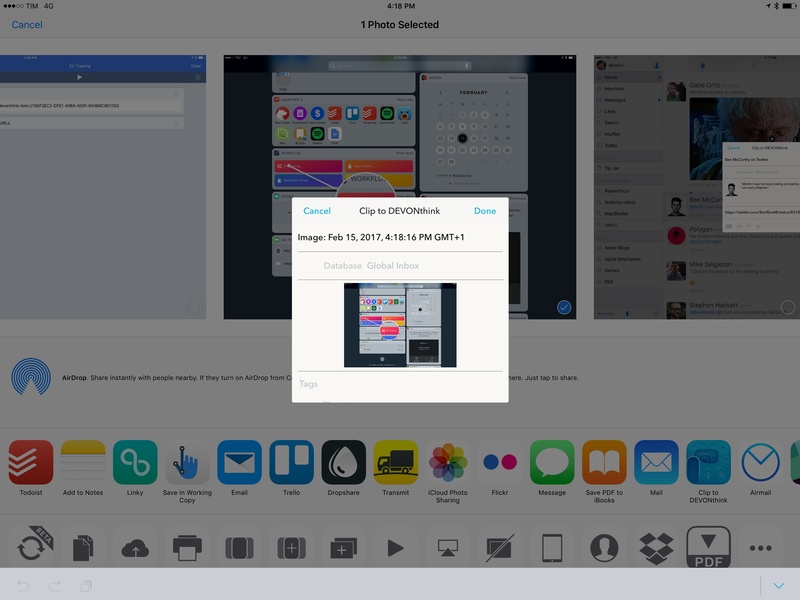 The widget will launch the individual file in DEVONthink with one tap. 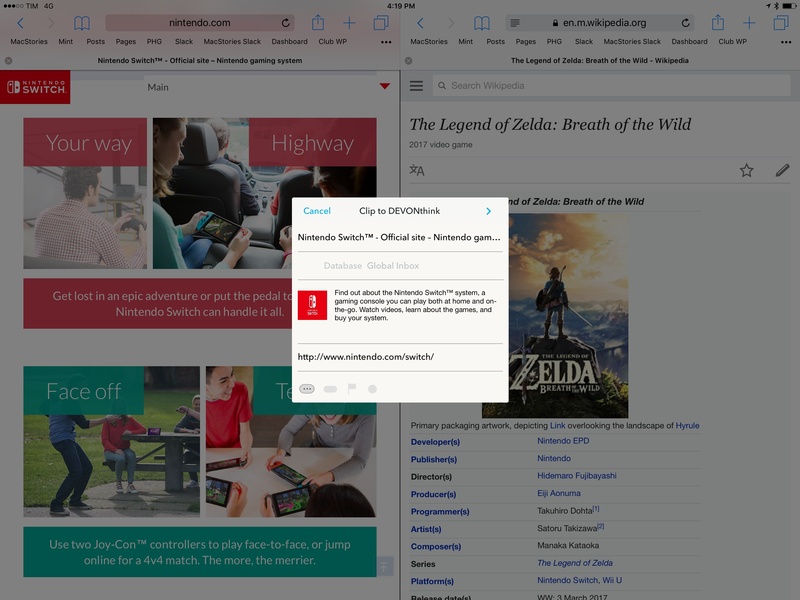 DEVONthink's item links are consistent across platforms: you can get a link to a screenshot stored in DEVONthink for iPhone and it'll open the same file on the iPad (and Mac) as well. The ability to create permanent URLs for files and groups is unique to DEVONthink, and I'm considering it as a way to organize my iOS 11 research material this summer. With an easy way to recall external items, I could spend less time in Scrivener's file manager and insert temporary DEVONthink file URLs in my draft to reference images or PDFs.3 Plus, I'd be able to set up launchers with Workflow and Launch Center Pro to quickly access items for any longform story I'll work on throughout the year. There are a few options to create and send new files to DEVONthink. 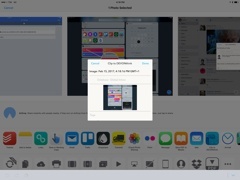 The 'Clip to DEVONthink' share extension is solid: webpages are clipped with a preview image, URL, and description; files such as images and PDFs are copied into the app, and the extension is also supported in Photos for copying multiple images at a time to DEVONthink (which will be nice to batch import screenshots for app reviews). The DEVONthink extension fetches text and images for a twitter.com link shared from Twitterrific. Capturing an image from Photos. Clipping a webpage from Safari to DEVONthink. There's a URL scheme to create bookmarks and text notes in DEVONthink, but I've mostly used the app's built-in 'New Item' dialog to manually add files to my database. This menu includes a useful media picker with shortcuts for the last photo taken and a photo from your clipboard. 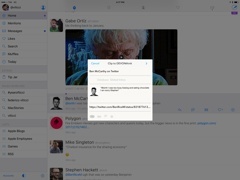 There's also automatic recognition of copied URLs that prompts you to add a bookmark. Speaking of which, bookmarks were one of the reasons I started exploring DEVONthink in the first place. For a while now, I've felt the need to permanently archive webpages I may need again in the future (such as technical documents and videogame guides). DEVONthink has some fantastic options for saving webpages from Safari and Safari View Controller. A webpage shared with the extension can be a bookmark, a Markdown (text-only) version of the page, or a web archive in DEVONthink. Mac users should be familiar with the web archive format: when saved this way, a webpage becomes an offline document that retains the original design and content of the web version. Imagine Reading List's ability to save articles for offline consumption in their original format, but with actual files that you can organize in a database. A webpage saved to DEVONthink as a web archive. Webpages saved as web archives in DEVONthink become standalone copies that I can access when I'm offline4; they don't disappear if the source page is pulled from the Internet, and, unlike PDFs, they're fully interactive in terms of text selection and tapping embedded hyperlinks. I appreciate being able to manage and categorize web archives alongside images and PDFs, but, mostly, I'm relieved I'm not keeping dozens of open tabs in my browser anymore. Aside from saving and managing files, DEVONthink stands out thanks to its advanced search feature. There's nothing like DEVONthink when it comes to searching for text matching specific conditions in a document or group of documents. DEVONthink supports search with Boolean operators, which include the NEAR and XOR flags; with these two options I can search for phrases that are within n words of each other, or where either one result or the other is present, but not both, respectively. The NEAR search operator lets you find phrases close to each other. DEVONthink's Boolean search has been a terrific addition to how I find workflows and apps I already covered in past issues of MacStories Weekly. If I remember I once wrote about the Spotify API, for example, I can search for NEAR(Spotify API, 10) and DEVONthink will look inside the Club MacStories PDF group and return documents where the words "Spotify" and "API" are separated by no more than 10 words. DEVONthink's search parameters are an aspect of the app I want to master going forward – though I wish these advanced queries could be assembled visually, perhaps with a dedicated search UI like on DEVONthink for Mac. Finally, I ought to mention that DEVONthink 2.1, released earlier this month, brought a document provider to open and edit files in other apps. If you've followed the evolution of document providers on iOS, you know it's rare to find developers who invest time in integrating their apps' file management features with iOS' document provider APIs. Editing a Markdown file from DEVONthink in Ulysses. Not only does DEVONthink let you pick files stored in its database from other apps – it lets you edit them externally, too. This opens up some intriguing possibilities: Ulysses and iA Writer can now edit Markdown documents stored in DEVONthink; webpages in Safari can look for files in DEVONthink when you tap an 'Upload' button; perhaps more impressively, you can open a DEVONthink PDF in PDF Expert, make edits in Readdle's app, and find your changes automatically reflected and still editable in DEVONthink. Like others, I don't use document providers on my iPad as much as I should, but DEVONthink's multifarious editing tools and integrations are a good reason to start. DEVONthink To Go goes beyond Apple Notes' simple but effective note-taking and Documents' traditional file management features. On the surface, it's an advanced file manager that can be used to move notes and files around, but I see it more as a powerful research tool for documents you need to reference, search, and integrate with other iOS apps. 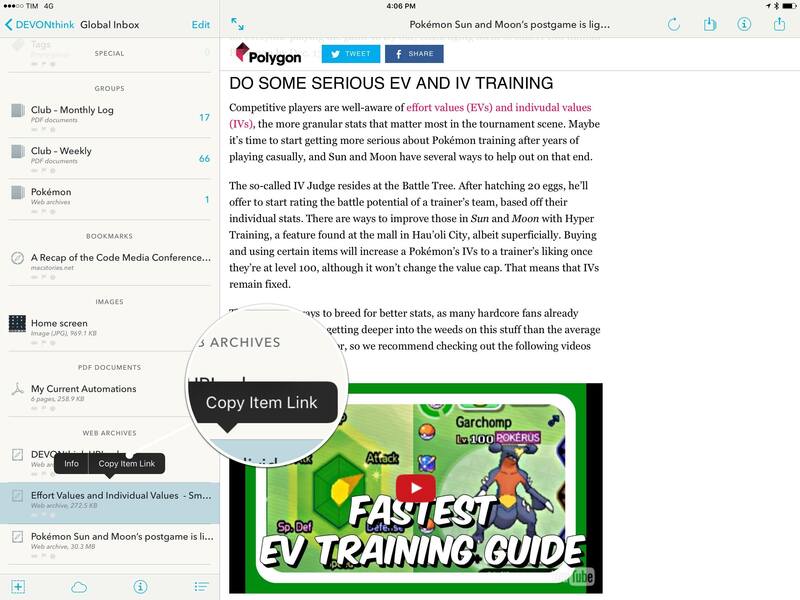 I believe DEVONthink's thoughtful blend of excellent capturing and search tools, unification of file formats, and inter-app document linking can help me offset the limitations of file management on the iPad. For this reason, I'm going to adapt DEVONthink to my writing workflow for longform stories I have planned this year. I'm glad I took DEVONthink for another spin.